Parijat Desai and Dancers is a dance company performing contemporary choreographic works by dancer/choreographer Parijat Desai. Desai has been developing choreography since 1994 and has received awards including the Durfee Foundation Artist Fellowship (2000) and Los Angeles’ Lester Horton Award for Performance (2001). The Los Angeles Times called Desai a major talent who bears watching offering clean, crisp, rhythmic attacks a powerhouse. (10/23/99) Critics have also described her work as matching technical sophistication with thematic relevance (Los Angeles Times, 10/8/01) and as a tensely fluid, unusual fusion (Dance Magazine, 12/01). Primarily working with bharatanatyam (Indian classical dance), modern/postmodern dance, and yoga, she strives to find organic connections between these forms. Although her choreography is a hybrid of forms, Desai tries to give aesthetic and technical integrity to each piece. In seeking intersections in dance, she aims to express a distinctly South Asian­American perspective, and also to communicate ideas across lines of language, culture, and nation. Her work has not only garnered positive reviews from mainstream press, but has enjoyed enthusiastic support from community audiences as evidenced by reviews in publications such as AsianWeek (7/02) and India West (3/10/01). Participation of Parijat Desai and Dancers at The Park’s THE OTHER FESTIVAL has been made possible in part through support from The Fund for U.S. Artists at International Festivals and Exhibitions, a public-private partnership of the National Endowment for the Arts, the U.S. Department of State, and The Rockefeller Foundation, additional support from the Doris Duke Charitable Foundation, and is administered by Arts International. What motivated you to get into dance? Even though I started training when I was young (5) and loved watching others perform, I actually didn't feel excitement about dance until around 16. Then I really began to feel the joy of moving to music and sharing that with others. By that time, I was learning both Indian classical dance and jazz. I was old enough to recognize that I loved movement, rhythm, and theater in a way that extended beyond a particular technique or culture. As a student of social sciences and humanities in college, I began thinking about our histories of colonization and immigration, of global demographic shifts, of ruptures and evolutions in culture; and I felt strongly that dance had to reflect that reality. Inspired by Black choreographers who had long been developing contemporary dance tied to their own experiences and by Indian musicians who were also experimenting, I felt I could (and should) find a way to integrate the dance vocabularies I knew. The aim became to express through dance the intersections that happen on a large scale and also in my own experience. Of course choreography that draws on multiple sources is nothing new; this is just how I began making dance. What keeps you going in tough New York city?! This question is an important one, and is bigger than a romantic notion of a passionate artist struggling in gritty New York City. In the US in general, it's difficult to sustain professional artistic activity, both because of the dearth of arts funding and because health care and health insurance are extremely expensive for all people. Among the so-called "developed nations" the US is one that is least invested in supporting the arts and people who practice them. And in terms of health coverage, nowadays (some would say under the Bush administration), even Americans with full-time jobs sometimes don't have coverage or have to pay tremendous amounts for treatment. What all this means is that even successful artists must piece together income in order to continue their work. And sometimes people must go without timely medical care. So what keeps me going? For income, I work as a copy editor for a magazine publisher. It's great because four of their magazines are about dance. (see lifestylemedia.com). But there is still little time to rest, after performing with and managing a dance company, too. The biggest motivators are of course dance itself and working with the wonderful artists who live here. Through some years of working together, my dancers and I have developed a strong connection and mutual understanding; their presence in NY brought me here and is what makes me stay. Besides my own company members, there are artists working in music and theater whose work is very exciting. I feel there will be many opportunities to work with such people here. On a broader scale, New York is still the center of dance in the US; and within the dance/arts community there are resources that artists themselves and other nonprofit workers have created. All of these things make the struggle worthwhile. Would it help a young Asian Indian dancer to know an Indian style of dance or not? Does your training in Bharatanatyam give you an edge when you collaborate with international dancers? There are many skills that a dancer gains training in Bharatanatyam, which she can apply to new situations. Training in Indian classical dance forms seems to give dancers a strong stage presence or charisma. They are also well-attuned to rhythm, and how to position their limbs in a clear manner. In some forms, dancers learn how to turn out their legs - which can be helpful when crossing over to other dance forms - and often also obtain a strong aerobic capacity. But to really answer your question, it would be helpful to break down what kinds of artistic situations a dancer might find herself in. One is where the movement vocabulary is strongly based on Indian classical techniques, but where new concepts and/or structures are being investigated. In that case, BN training would be very helpful. In fact the stronger her training the better equipped she would be to experiment as an artist or as a dancer working for another artist. At the same time, it would be important that she have a mental readiness to try new things. In a broader sense, I feel it is helpful for both the dancer and choreographer to have an understanding of how their experimentation fits into a long global history of dance innovation. 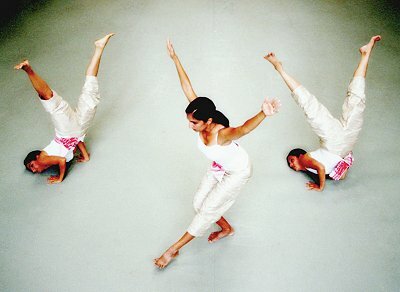 Another situation is one in which the movement vocabulary is very strongly influenced by modern dance technique. In that case, life would be hard for the person only trained in Bharatanatyam. Indian classical dance alone does not prepare a dancer to do contemporary or modern dance movements. These arenas of dance involve very different approaches to the body and to movement. In general, a Bharatanatyam trained dancer needs to acquire greater flexibility and needs to learn how move more fluidly. Sometimes (often) that means going counter to what her first technique demands and unlearning habits. In one instance, I worked on a project in with LA's JazzTap Ensemble for which director Lynn Daly wanted me as Bharatanatyam dancer. No doubt the training distinguished me enough to get selected. However, it was my training in modern and other forms that allowed me to be versatile and move with the other dancers who were trained in different forms. I think there are number of movement forms that can expand a dancer's capacity to move more fluidly or organically: yoga, tai chi, ballet, Indonesian dance, even swimming. All these movement forms teach you to connect one movement to the next smoothly. They also require you to connect your breath to the movement. Another important factor is learning to move with the full body, instead of thinking in terms of individual body parts; yoga, martial art, ballet, and modern dance are all helpful in this. If one has no access to classes like these, perhaps a sport like tennis or badminton could help one learn to be agile with the whole body. (I'm saying all of this because I myself began as a stiff bookworm and am still learning how to break out!). In general, I find that studying multiple techniques helps expand my movement capacity and facilitates the creative process. What is your opinion about the current Bollywood style of dance that draws huge audiences into theatres and encourages “live” shows by Indian film stars around the world? As we all know, regardless of what I think about Bollywood, it is here to stay. So mostly I say, "Ahh, c'est la vie!" But since you asked, what I simply cannot bring myself to feel comfortable with are 1) Bollywood's representation of people and society; and 2) the fact that every movement (dance or otherwise) on the screen is selected based on to trying to sell something - the story, the emotion, the star, the film itself. My friends will tell me, of course all of this is problematic. Of course they always highlight the white-skinned dancers and make all the central characters live in palatial homes and enforce strict notions of femininity and have the big fair-skinned people seem smarter and more "good" than darker or smaller people, etc, etc. "Hey," they say, "that's how it is! You just have to turn your brain off, relax and enjoy it, yaar." I don't know if it's because I can't turn my brain off, because I am aware of how powerful any kind of representation is in reinforcing our beliefs/views, or because of how absolutely opposite my goals as an artist are to the goals of Bollywood dance. Whatever the reason, I repeatedly cringe at the both the way stories are told by Bollywood and how dances are made. I'm excited, on the other hand, to see how independent Indian film is developing. Indie indies? Could you briefly describe your creative process - what triggers ideas for a composition? Is the choreography a team effort? Ideas for choreography come from music, from ideas or events, from text, and from questions about movement itself. I am always interested in exploring new possibilities within dance techniques and ways to integrate different forms. Coming across a music style or composition that moves me (Hindustani thumris, for example) or that is investigating crossover (UK Asian electronica) also triggers a great deal of choreographic excitement. Hearing that music, I begin to see movement ideas and usually a movement language for a given piece starts to emerge. I play around with it on my own and then bring it to the other dancers, introducing through phrases or exercises. Later this vocabulary grows into choreographed phrases. Some of my investigations are pure movement to music. Other times it feels important to take on the philosophical or political questions (e.g., what does it mean to be a warrior? What is the nature of archetypal Indian womanhood - is it beautiful or oppressive?). Text may add layers to the idea exploration. I've used Indian folklore, spiritual literature, lyrics, and political writings as part of what shapes the choreography. Re: team effort, now that I have been working with dancers who are familiar with the vocabularies I'm drawing on, it's much easier to involve them in the creative process. While I might set the stage by putting forward a language of movement, they help develop individual phrases, work through partnering sequences, or help solve problems with transitions or counts. With thematic or theatrical issues, again, though I might be the one with the starting vision, we discuss what is being explored and how they think about it. Because the dancers are actually inside the piece doing the movement or expressing a character, their views should shape our choreographic decisions. It's a constant balancing act between directing the process according to an evolving vision, and facilitating that creation in an inclusive way - knowing that when people can participate and contribute, they feel more engaged and the choreography is that much more alive. How do you and your team feel about performing at The Park’s THE OTHER FESTIVAL 2004, especially since you had to cancel last year due to surgery, etc? We are all very excited to be able to come all the way there, and to participate in such a cutting-edge and multifaceted event. We feel doubly grateful that we were invited a second time and that we were able to obtain travel funding again. Performing in India can feel special, like a homecoming; but it can also feel intimidating, because The Other Festival is in Madras, a classical dance capital. But we know that we put our hearts into this, and have hurdled many challenges. So ultimately we look forward to sharing our work and learning from others.